For A Killer Team Defense!! In basketball, defense really DOES win championships. Did you know... of the last 50 teams to make the NBA finals, 44 of them had a top 10 defense? Defensive success is NOT just about hard work and hustle. Understanding and executing team defense concepts and strategies is what separates the good teams from the GREAT teams! Players of all ages can use these concepts to shut down their opponents and dominate their league. You CAN do this, no matter how much your defense is struggling right now, or how little experience your kids have! If you're a basketball coach who wants to tighten up your team defense, shut down your opponents, and win more games this season, then please listen up. This is something you do NOT want to miss! 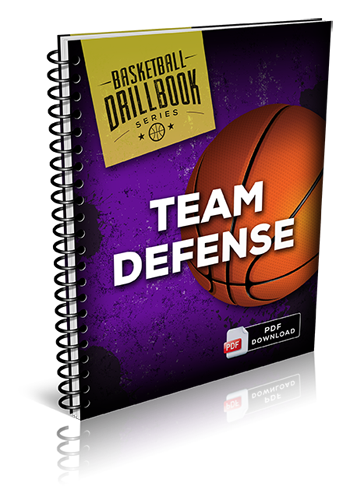 The Team Defense Drillbook is jam-packed with 26 all-new, stunningly effective drills that will have your team playing defense like a well-oiled machine. From basic fundamentals... to challenging, competitive practice ideas... to advanced in-game strategies... it's ALL here! And it's all explained with simple, step by step instructions and diagrams that ANY coach can understand! Part 1, Team Defense Fundamentals, focuses on the basic team defense skills and principles all basketball players need to understand. You'll discover seven wickedly effective team defense drills for developing spacing, footwork, rotation and communication skills. Every drill is designed to increase your team's "defensive IQ" while giving them the tools to play unstoppable team "D" in a real game situation. Jump to Ball Drill: Discover a simple technique that easily prevents give and go layups and backdoor cuts. This one simple "tweak" alone will bog down your opponent's offense and force them into taking low percentage shots! Hide and Seek Drill: Wickedly effective transition defense drill that applies your team defense principles in a full court, fast break setting. A cool "scramble" variation that trains your team to lock down the paint in chaotic situations! Three-Stop Drill: A competitive drill that teaches your kids to defend with maximum effort. Every drill is explained with simple, step by step instructions, vivid diagrams and useful coaching pointers. So you can learn the material today, and start using these techniques in your very next practice! In part 2, Team Defense Strategies, we'll shift our focus to in-game tactics. It covers 19 of the most common offensive plays you'll come up against... and shows you EXACTLY how to defend each one! You'll get pinpoint instructions on how to read different offensive formations, position your players, and rotate them for maximum defensive effectiveness. All explained with easy-to-understand drills you can be reading in just a few moments! How to defend downscreens and back screens between posts and wings. Learn how to handle this common tactic (and avoid the common mistakes rookie coaches make!) on page 8. How to stop dribble penetration cold in it's tracks, without leaving post players open for easy drop-off passes. How to defend the baseline double screen and wing double screen. This is a common technique that great shooters use to get open for jumpshots... popularized by guys like Reggie Miller and Ray Allen. You'll see exactly how to shut down this dangerous play, even if your defenders are slow or small! How to defend the UCLA Cut. This is another common play that coaches at the youth and high school level love to use. You'll learn the best way to "smash" this dangerous cut through the lane on page 12. The three best ways to defend the dribble handoff. How to defend the Screen on Screener play. This is one of the toughest tactics to stop, especially when you're facing a point guard with great court vision. Go straight to page 14 for the solution. How to defend the post to post screen. How to defend the "small on big" cross screen. Do NOT switch on this play. We'll show you what to do instead. How to provide help on a dominant post player, without leaving dangerous shooters open. How to defend back screens. Master this simple secret, and your team will never get caught on a "back door" again! Whether your opponent is running a motion offense... a dribble drive offense... a flex offense... a 1-4... or anything in between. Your players will know exactly how to throw a wrench into their offensive strategy and force them into bad decisions, low-percentage shots, and costly turnovers. 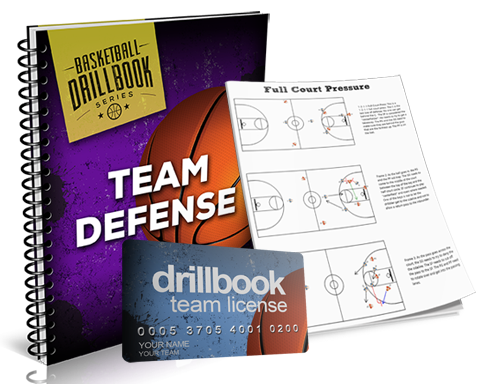 The Team Defense Drillbook is an essential part of any serious coach's library, whether you're brand new to the game, or you've been coaching for years. The drills and concepts you'll learn WILL translate to more wins for your team, no matter what level you play at, or how much you're struggling on defense right now. Sure, I've been studying basketball defense for a long time - but I still consulted every coaching expert I knew, and personally tried and tested dozens of different drills with my own teams, then added my own personal experiences to develop this system. All 26 of these drills are based on concepts and ideas from some of the most established and successful high school, college and pro coaches of all time. Jack Bennett - former head coach at University of Wisconsin-Stevens Point, and the winningest in its history. Led the 2004 and 2005 men’s basketball teams to the NCAA’s first Division III back-to-back national championships. He accumulated a 200-56 record in nine years at UWSP and was a national and state Coach of the Year. He coached a total of 33 years at the collegiate and high school level, with winning records for 32 seasons. Joe Lombard - head coach at Canyon High School. In 2003, Lombard’s team became the only Texas girls team to win the USA Today National Championship. Lombard has been named Texas High School Coach of the Year and National Coach of the Year in 2003 and 2011. Lombard holds the record of 15 basketball state championships, and he has been inducted into the Texas Hall of Fame and the Texas Girls’ Coaching Association Hall of Fame. Steve Brooks - head coach at Indiana Wesleyan. Brooks led the Wildcats to two NAIA Division II National Championships, coming in 2007 and 2013. The 2007 squad was the first ever NAIA women's basketball program to finish undefeated with a 38-0 mark. For the team's accomplishments, Brooks was honored as the Women's Basketball Coaches Association Coach of the Year in 2007 and 2012, and Phyllis Holmes' NAIA Coach of the Year in 2013. The Team Defense Drillbook is delivered to you in PDF format, so you can get instant digital access... right over your computer screen, smartphone, tablet, or eReader... from anywhere in the world with an Internet connection! I've pulled together in one simple collection every drill you'll need to develop top notch team defensive fundamentals... and help your team understand the concepts and strategies to shut down opponents and win more games. This system is guaranteed to work with kids of all ages, from Bitty Ball through High School and beyond- no if's, and's or but's about it. So if you're serious about becoming a better coach, and if you would like to instantly have a proven plan to create a defensive powerhouse, click the Add to Cart button below now. Some games, it seems like there's a lid on the basket, and your players can't make a shot from anywhere. Injuries can put your best scorers on the bench. Or your entire team can catch a bad case of the butterfingers and you can barely hold onto the ball. But no matter how bad things get on offense - defense is ALWAYS your trump card. Great defense can keep you in the game when your offense is struggling. Great defense can bring your team back from a big deficit. And great defense can even the playing field against, bigger, faster or more skilled teams. Guarantee #2 - If you actually follow these drills in practice and don't see an immediate improvement in the way your team plays defense, I'll actually refund TWICE your money. 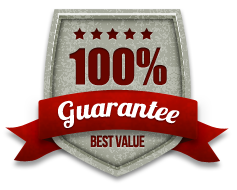 And to make sure you really hit the ground running, I'm also going throwing in two exclusive bonuses valued at $59.90! I want to help you extend your team defense principles into a suffocating full court pressure, so you can force more turnovers and get more easy baskets to your team! 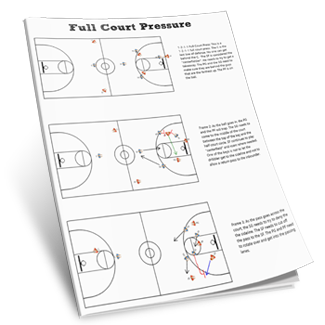 That's why I'm including this Full Court Pressure Mini-Playbook as the perfect complement to your Team Defense Drillbook! Inside, you get instant access to four killer full court trapping strategies. Time is very much "of the essence." If you want to develop a dominant basketball team this season, you need to start right now. This report is so essential I'm practically giving it away because I want to make sure you take the simple steps to becoming a team defense mastermind. So you can start shutting down your opponents and winning more games right away! 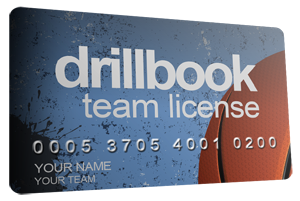 Click the Add to Cart button below to get instant access to the Team Defense Drillbook Risk Free for just $7. YES, I want in! I want access to your "Team Defense" drlllbook, plus the Team License and the "Full Court Pressure" mini-playbook. Please give me INSTANT access to this step by step drill collection right now! There's no need to waste your time searching the web for unproven ideas, or spend hundreds of dollars on coaching clinics. Just download the Team Defense Drillbook and you'll get instant access to a complete drill collection you can start using today! Team Defense Drillbook now for just $7!